Beautifully Arts & Crafts oak casket with seed heads, daisies and leaves carved to all sides. Offered in excellent condition and measuring 15cms in height, 27cms wide and 17cms in depth. There is no key. A lovely set of four Arts & Crafts tiles with stylised flower heads in the shape of heart. Marked to reverse L & B.T. England, possibly William Adams for Lea and Bolton. Offered in good condition with one small chip to reverse of one which does not show at its front. They are 6 inches square or 15cms. Pretty Arts & Crafts dressing chest in walnut with lovely copper handles and heart shaped escutcheons. Made by Shapland & Petter of Barnstaple. The locks are stamped and there is an ivorine makers mark to the back. The stretcher to both sides has a row of pierced hearts. It has its original bevelled edged mirror plate which is in excellent condition. The condition of the whole chest is good with a few marks to top due to use over the years. Height 160cms. Width 115cms. Depth 54cms. Work height 79cms. Set of four Arts & Crafts tiles - Dresser? Set of four Aesthetic movement tiles in the manner of Dr Christopher Dresser with a large urn to centre with leaves and a daisy to each corner with a rising sun. Marked to reverse only with a H. Offered in reasonable condition with nibbles to some corners and a few surface knocks. Each measures 6 inches square or 15cms. It is rare to find a charger of this size and quality. 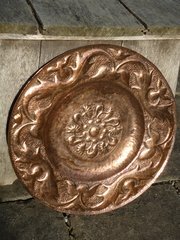 This Arts & Crafts copper charger is 61cms or 24 inches in diameter and has a depth at the well of 4cms. Weighs 4.5 kilos. It has a border of stylised acanthus leaves and the well is decorated with a daisy and stylised flower heads. Superb quality and condition. Probably made by the Guild of Handicrafts by John Pearson but marks to back not really clear. A wonderful centrepiece for a large dresser. I have a table stand should it be wanted as a table. 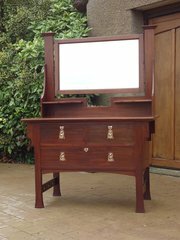 Lovely Arts & Crafts oak bureau retailed by Liberty & Co with ivoriine label to drawer. 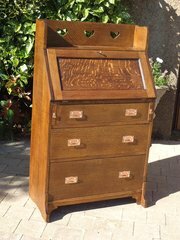 This bureau is illustrated in Darly Bennett's book on Liberty furniture, Made in quarter sawn oak the grain shows beautifully now that it has been cleaned and waxed. Delightful pierced hearts to gallery. Height 119cms, width 71cms, depth 36cms at body and 39cms at feet, The writing height is 73cms. Offered in good condition with working lock although the lock is a little stiff. Unusual Arts & Crafts Scottish school brass jardiniere or fruit bowl.This stands on four round feet and has lovely sweeping handles and decorated to both sides with stylised leaves. Height at handles 17cms and at the centre 11cms. Width 45cms. Depth 12cms. Offered in good condition, just minor wobble front to back. 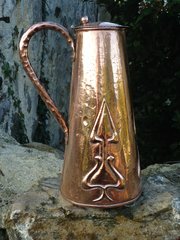 Arts & Crafts copper lidded jug made by J & F Pool of Hayle in Cornwall. Decorated with Glasgow style. hearts. This stands 28cms high and is 15cms in diameter. Offered in good condition but with some dings as shown and an historic solder to lid. Set of four Arts & Crafts oak Cotswold school tub chairs possibly by Gordon Russell. Perfect around a small dining table. 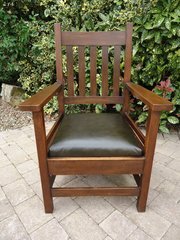 These have been cleaned and refinished and upholstered with a drop in leather seat, two green and two brown. Height 46cms. Width 51cms, Depth 40cms. Seat height 48cms. 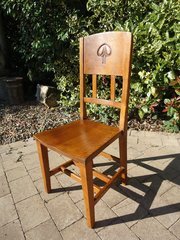 Arts & Crafts oak chair designed by William James Neatby 1860 - 1910. with a stylised tree to back/ Offered in good condition having been stripped and refinished and and is a lovely golden oak. Height 100cms. Width at front of seat 45cms. Depth 42cms with a seat height of 47cms. Large Arts & Crafts arm chair with leather seat. Unusually large American Arts & Crafts arm chair in oak with newly upholstered green leather seat and lovely wide arms. Offered in good condition having been cleaned and waxed. Height 111cms. Width at front of arms 72cms. Depth 66cms. Seat height 47cms. Very comfortable. Believed to be American.